(Photo:English: Looking east at the National Mall in Washington, D.C., in the United States in the summer of 1901. The Mall still exhibits the 1851 Victorian-era landscape design of winding paths and random plantings designed by Andrew Jackson Downing. Virginia Avenue SW extends into the distance on the right. The slum known as Murder Bay is visible on the north side of the Mall (left). 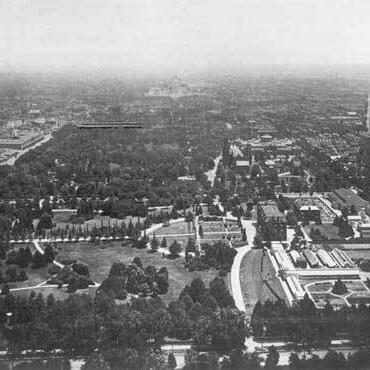 The complex of buildings in the lower right is the 1868 United States Department of Agriculture building and 1870 conservatory.